From the Redwood Forest to the Gulf Stream Waters, Muir Way’s National Parks’ maps showcase America's protected land treasures (and some popular Canadian ones too). Designed in a variety of colors, with an artistic approach, they easily coordinate with many home decor palettes. 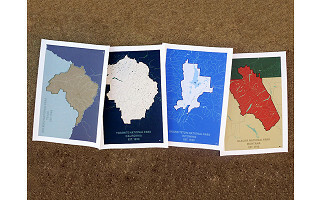 Printed in San Diego, California, the maps are the creative vision of Jared Prince, an avid outdoorsman who loved travel maps as trip mementoes. But, he would often lose them or they were too shabby to frame. Partnering with a graphic designer, he created frameable prints that feature soft hues and clean lines. Jared is a supporter of The Sierra Club, whose founder, John Muir, is the namesake of his company. All materials are sourced in America, from the matte-cotton paper to the high-quality archival ink. The packing materials are recycled and recyclable too. Whether you remember your trip to The Grand Canyon in red, or dream of skiing Banff in blue, hang these maps on your walls as you would any art and commemorate the places you’ve been and or want to go to most. Hi, I'm Jared Prince, the founder of Muir Way. 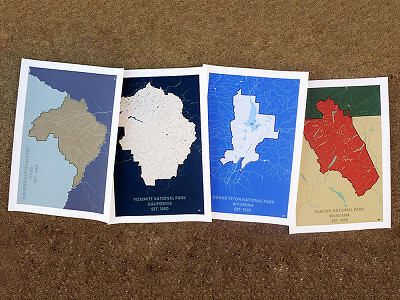 I created these maps to provide a modern, colorful twist to the traditional National Park map. I am here to answer any questions you may have about them or the company. Thanks for looking!" I wish there was a map of Chicago and all it's neighborhoods. I would love to buy one if it becomes available! @Stefanie I apologize, wrong thread to comment on! Have you considered adding the Virgin Islands National Park on St. John US VI. I have a home on this beautiful island and you would love it. @Linda Hi Linda, yes we have a map of the Virgin Islands NP. The best way to inquire about it is to contact The Grommet Customer Service team here and they'll put you in touch with me. Thanks for taking a look! From the Redwood Forest to the Gulf Stream Waters, Muir Way’s National Parks’ maps showcase America's protected land treasures (and some popular Canadian ones too). Designed in a variety of colors, with an artistic approach, they easily coordinate with many home decor palettes. Printed in San Diego, California, the maps are the creative vision of Jared Prince, an avid outdoorsman who loved travel maps as trip mementoes. But, he would often lose them or they were too shabby to frame. Partnering with a graphic designer, he created frameable prints that feature soft hues and clean lines. Jared is a supporter of The Sierra Club, whose founder, John Muir, is the namesake of his company. All materials are sourced in America, from the matte-cotton paper to the high-quality archival ink. The packing materials are recycled and recyclable too.